What a better way to reward your kids for a great accomplishment, end of school term or simply have a fun outing than a field trip to Pump It Up! 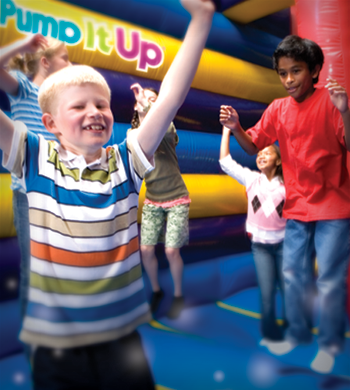 Pump It Up offers non-stop, active fun that includes jumping, sliding, and climbing on our giant inflatables and other interactive games that kids love so much! Pump It Up is a private facility so your field trip is 100% PRIVATE which means only you and your group at your event. We also provide plenty of staff to supervise your event so that you don't have to... you can just sit back and watch your kids have an awesome time! * Above pricing is for Monday-Friday before 2 pm. A signed waiver on each child and socks are required to participate. We are an approved vendor for MISD and other school districts. Call us for more info or to request a formal quote. Book your field trip today! 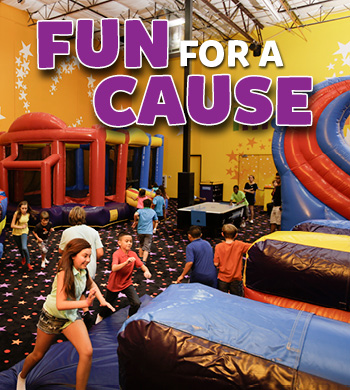 Pump It Up makes FUN-draising and organizing your group event FUN and EASY! If you need to raise MONEY...we can offer fundraising rebates to qualified organizations or groups. We can assist you in creating memorable customized events for groups of ALL sizes. We can also help you determine the price per person to maximize your potential donations, and help manage the event. Call us and let us help you get your event started. Your guests will have a blast!